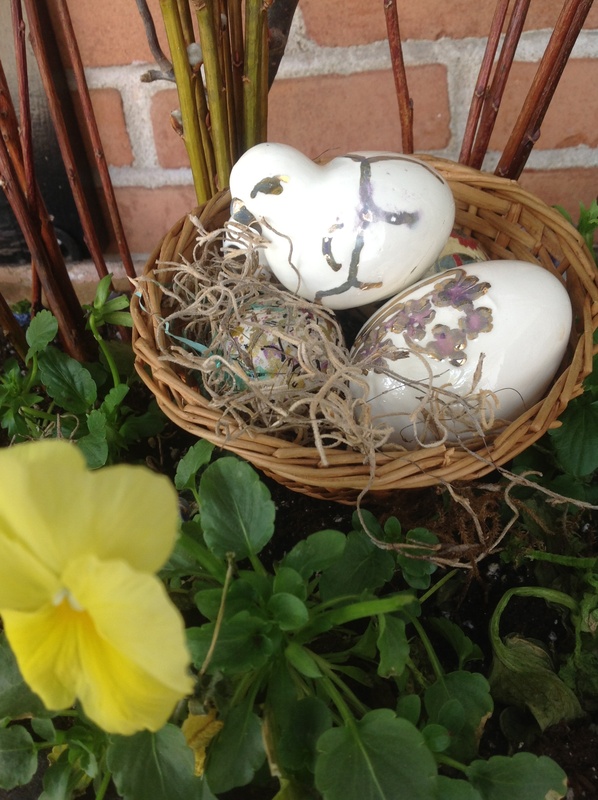 Marble eggs in pastel colors(JoAnn’s) were nestled in the various planters for a nod to Easter that is subtle yet sophisticated. 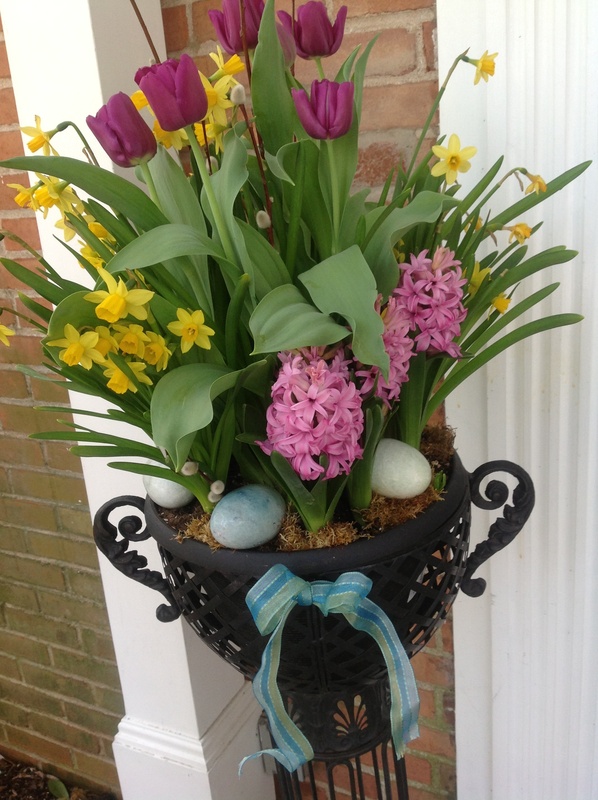 Pastel ribbon was added to each planter while the wreath was kept without ribbon adornment. 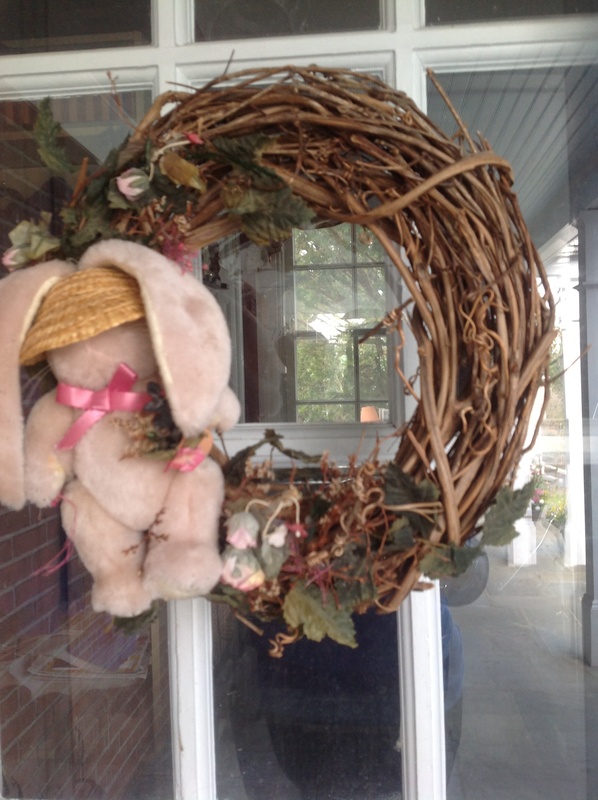 This wreath(JoAnn’s) is a favorite of mine. 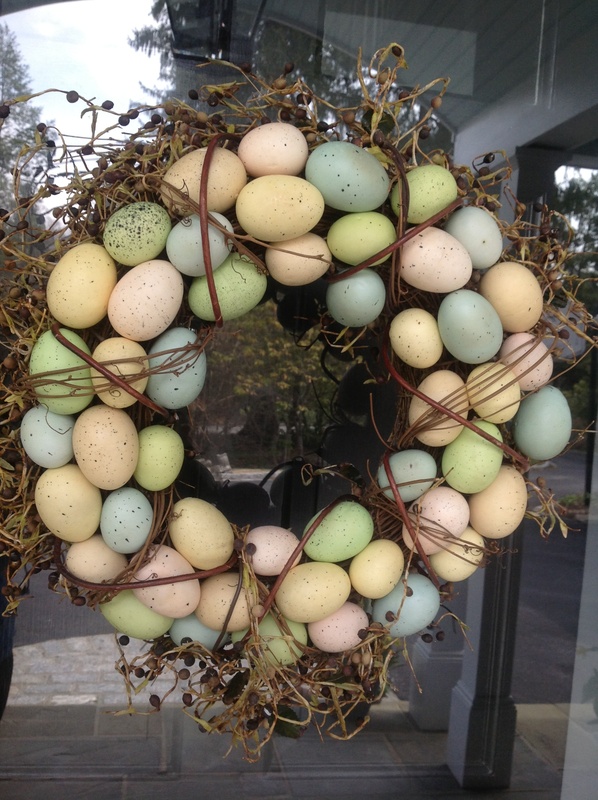 I layered it over a second wreath of berries on a gravevine form for a bulkier wreath, with the second wreath giving the illusion of a nest. 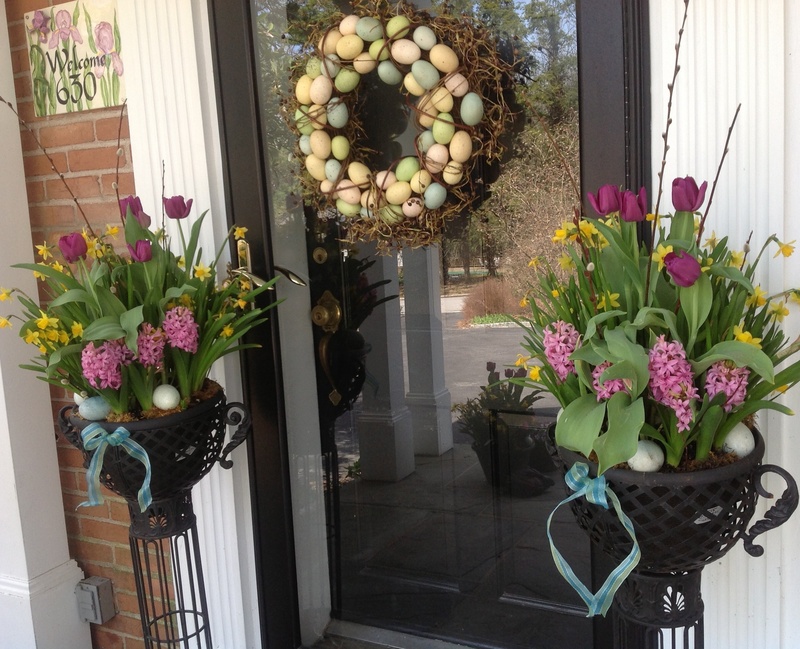 I simply connected the egg wreath to the second wreath by tying it with tendrils of that wreath at about 6 points. 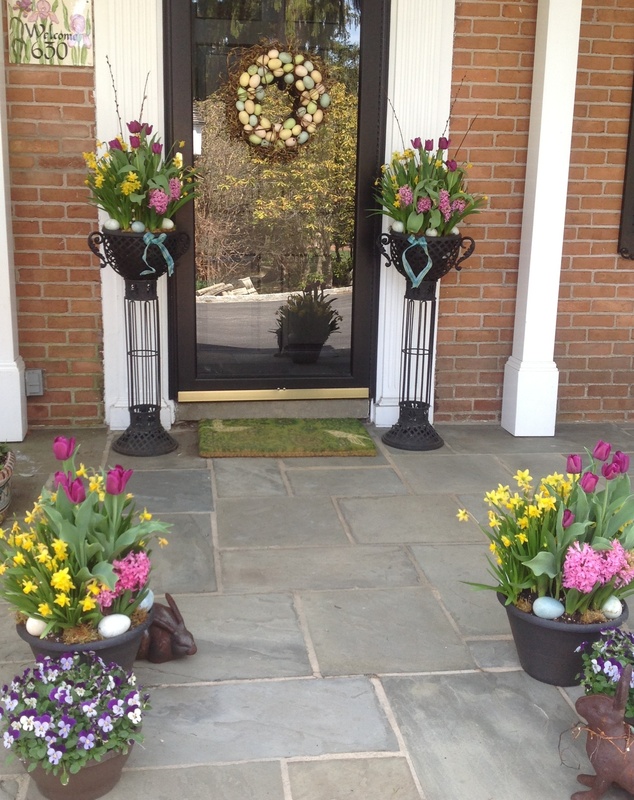 Our mudrrom entrance, just to the right of our front entrance is also dressed up for an Easter welcome. 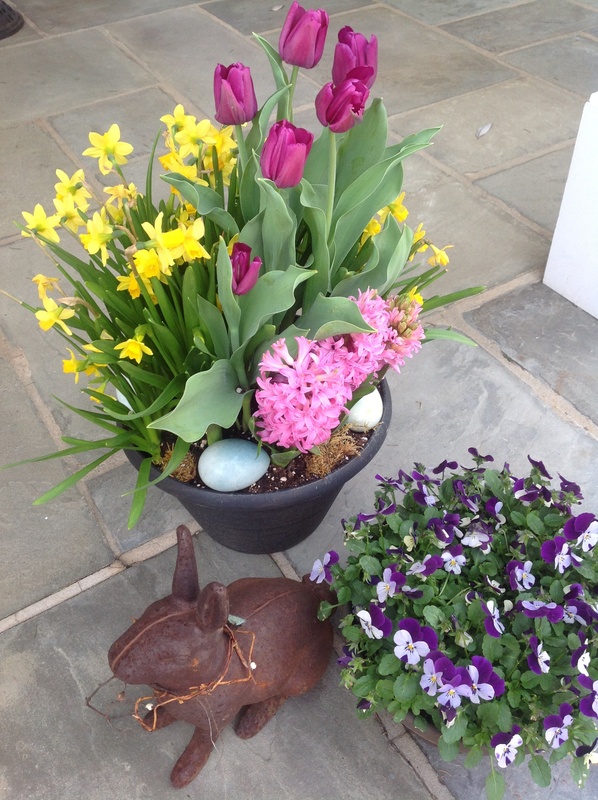 Metal rabbit statuary was given a more prominent place in the décor(Smith Hawkins and Takashima). 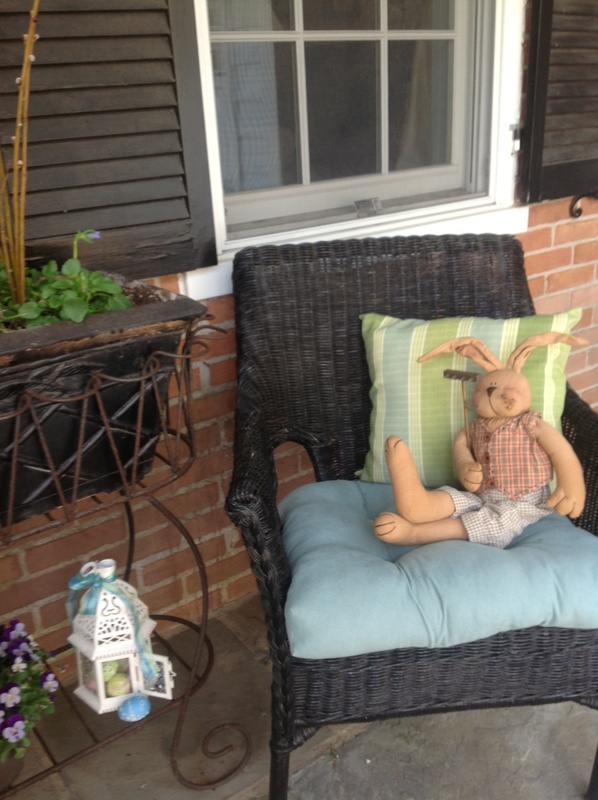 The seating area is beckoning and festive for a relaxing spot on the porch with stuffed rabbits cozying up in the inviting wicker chairs. 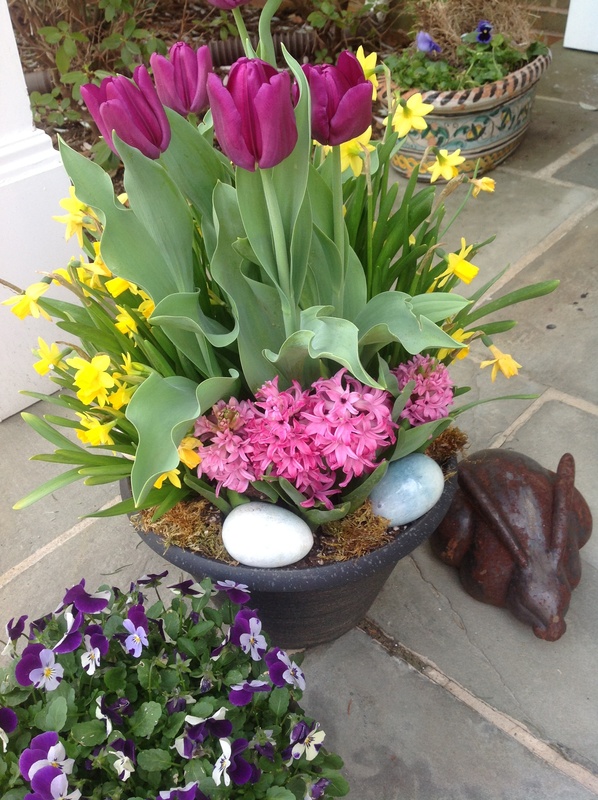 A basket with a ceramic chicken and some eggs in a bed of sphagnum moss continue the theme in another planter. 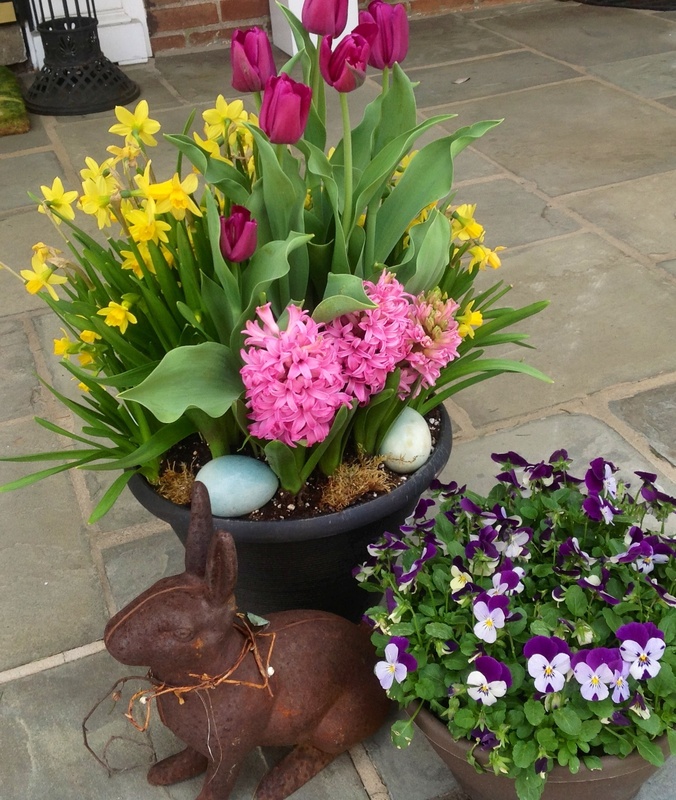 A garden bench just to the left of the entrance is also decorated for the season. 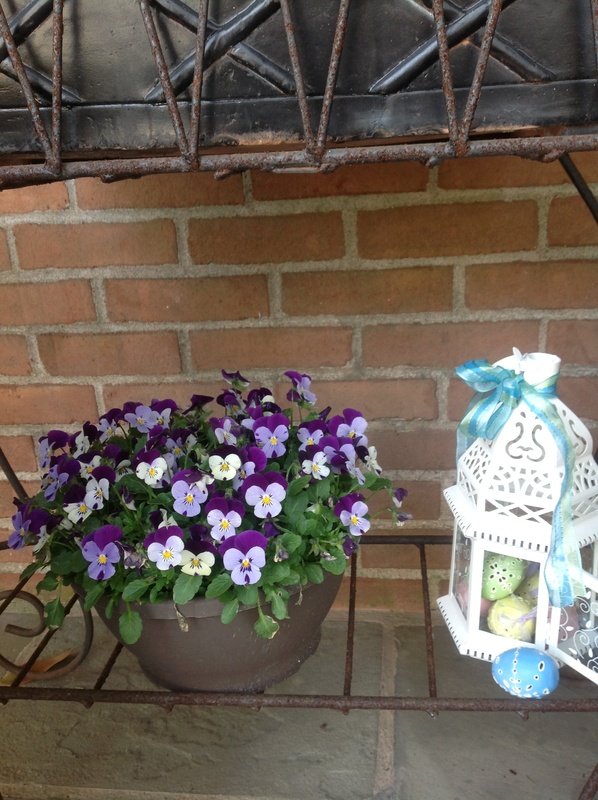 Coming soon: How I transformed this porch into an outdoor room. 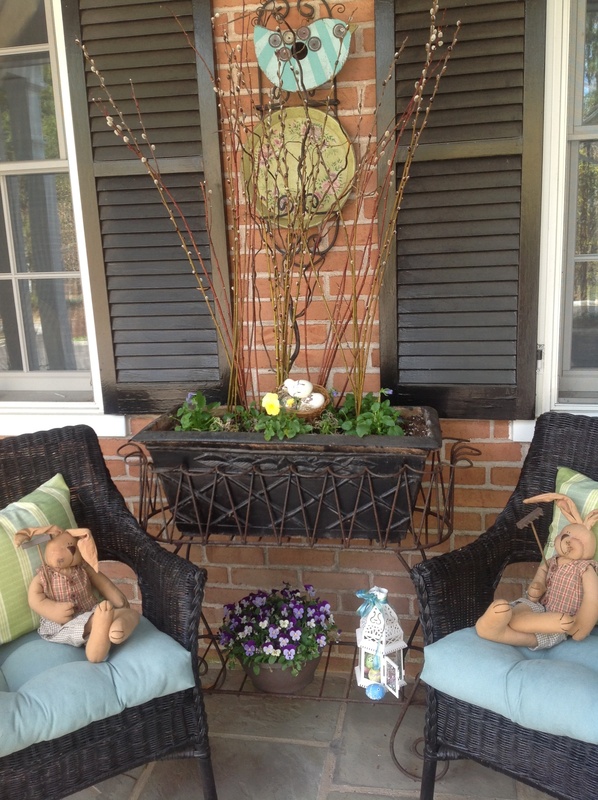 This entry was posted in Crafts, Gardening, Home Décor and tagged bunny wreath, easter front door welcome, Easter wreaths, egg wreath, front porch ester decor, spring decor with eggs and bunnies by Johanne Lamarche. Bookmark the permalink. 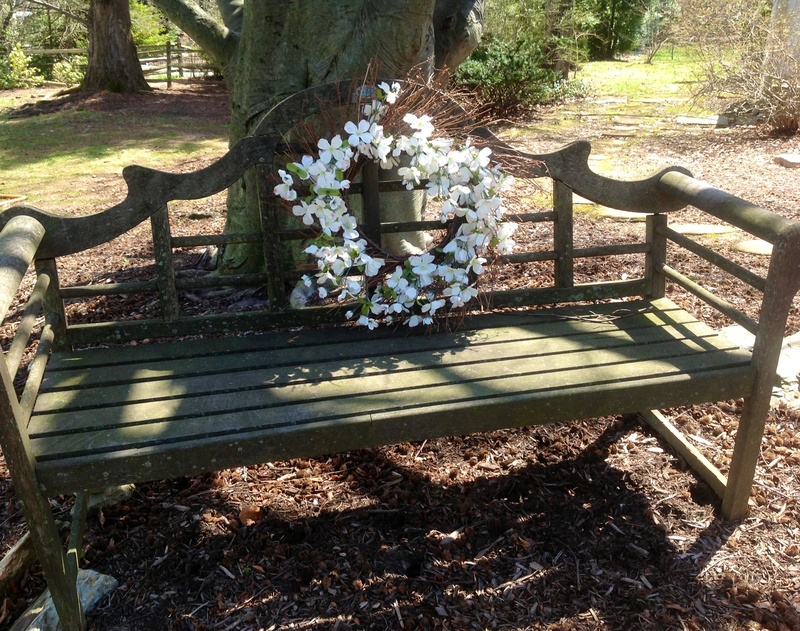 I LOVE the wreath on the bench!!! I’m going to pass that idea along to my Mom for the Memorial Garden that is currently under construction to honor my Dad. Thank you Alycia! Finer weather will be coming your way soon! 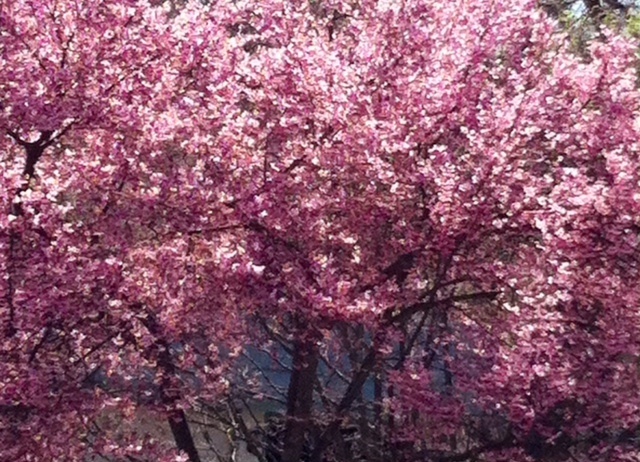 We went from cold to 80 degrees overnight it seems, so everything is bursting into bloom quickly and all at once. 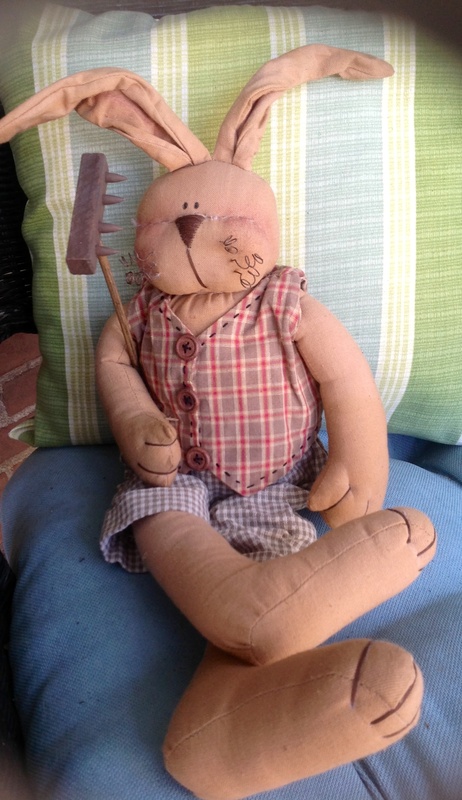 I want to put the brakes on and slow spring down! We should get some cooler days later this week.